Creating the most imformative array to assess specific conditions requires in-depth knowledge in a variety of highly technical fields. MI can contribute extensive expertise in early stage diagnostic assay development, assay and microarray validation, and unique manufacturing capabilities to product the most accurate and precise array for the application. From the development of an assay concept through the testing phase and onto production, MI scientists are available to you for consultation throughout the process. 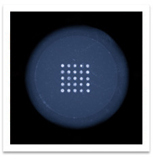 Microarray-based assays are among of the most technical and customized products at MI. Our array technologies offer placement of a wide variety of probe types onto an array, leading to a high throughput assay for a variety of ligands. Our capabilities include moving traditional ELISA tests to a microarray format to accelerate throughput. Please complete the Contact MI form to begin the process. An MI scientist will contact you with information on how we can accelerate your assay development efforts. Diagnostic and prognostic arrays often provide clinicians with valuable information which can result in signiﬁcantly improved patient outcomes in both medical and veterinarian settings. MI's array technology offers enhanced capabilities for determining diagnosis and/or treatment based on the most pertinent data. Arrays can provide accurate and affordable testing by running many assays from an individual sample in the microarray format. A pilot project is typically utilized during the development phases of diagnostic/prognostic arrays to ensure development of robust, meaningful and speciﬁcally-targeted assays. MI scientists will work with you to identify factors which may impact the successful development of the required array assay. Our dedication to producing the highest quality product is supported through our GMP (good manufacturing procedures). All fabrication is completed in climate-controlled labs where our scientists use GLP practices for sample handling, laboratory control, personal safety protection, and process control to achieve the best results for your project. MI supports our clients through each stage of regulatory approval processes including site certification requirements. Please complete the Contact MI form. An MI scientist will contact you with information on how we can accelerate your diagnostic/prognostic assay development efforts. MI provides a spectrum of product development services to our commercial clientele which ranges from corporate start-ups to Fortune 500 companies. MI is highly proﬁcient at taking early-stage intellectual property through a rigorous process of platform design, optimization, validation and regulatory control. Regardless of our client's level of need, MI always provides a highly experienced, personal, and accessible partner willing and able to address every aspect of your array design and manufacturing. OEM arrays are often very specialized and typically must conform to the manufacturing standards dictated by external control and regulatory agencies. MI is able to manufacture arrays to meet exacting validation parameters to match all the specific product requirements. Client-proprietary substrate surfaces or dimensions are readily accommodated on MI's unique array manufacturing platforms. Custom OEM services range from the design of microarray layout and content to pilot projects for research and development testing to replication for existing products when a secondary or replacement OEM provider is required. You'll receive your array product in the exact conﬁguration needed to integrate with your company's processes. MI helps remove the challenges associated with new product development via innovation and creative problem solving, coupled with extensive expertise in platform development. Please complete the Contact MI form and learn how OEM services from MI can improve your company's profitability. Please complete the project inquiry form to begin the process. An MI scientist will contact you to discuss how we can help you accelerate your assay development efforts.